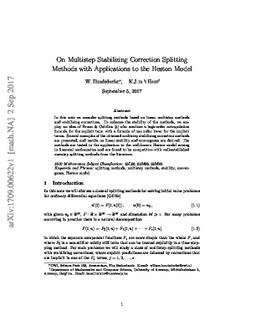 In this note we consider splitting methods based on linear multistep methods and stabilizing corrections. To enhance the stability of the methods, we employ an idea of Bruno & Cubillos  who combine a high-order extrapolation formula for the explicit term with a formula of one order lower for the implicit terms. Several examples of the obtained multistep stabilizing correction methods are presented, and results on linear stability and convergence are derived. The methods are tested in the application to the well-known Heston model arising in financial mathematics and are found to be competitive with well-established one-step splitting methods from the literature. Keywords splitting methods, multistep methods, stability, convergence, Heston model. Hundsdorfer, W, & In't Hout, K. (2017). On Multistep Stabilizing Correction Splitting Methods with Applications to the Heston Model. arXiv.org e-Print archive.